A proper pool opening is a very important start to the swimming season. If not done correctly your pool could be in for a long season of problems. The swimming season in this region is short enough, so to risk your swimming pool opening to anyone other than S&R Pool & Spa could lead you down a road of disaster. S&R Pool & Spa will: Remove your winter cover, remove the winter plugs, Install your ladders, Install your handrails, Install your diving boards, Prime and start your filter system, Test and report to you a full chemical analysis of your pool water, Treat and balance your pool water. 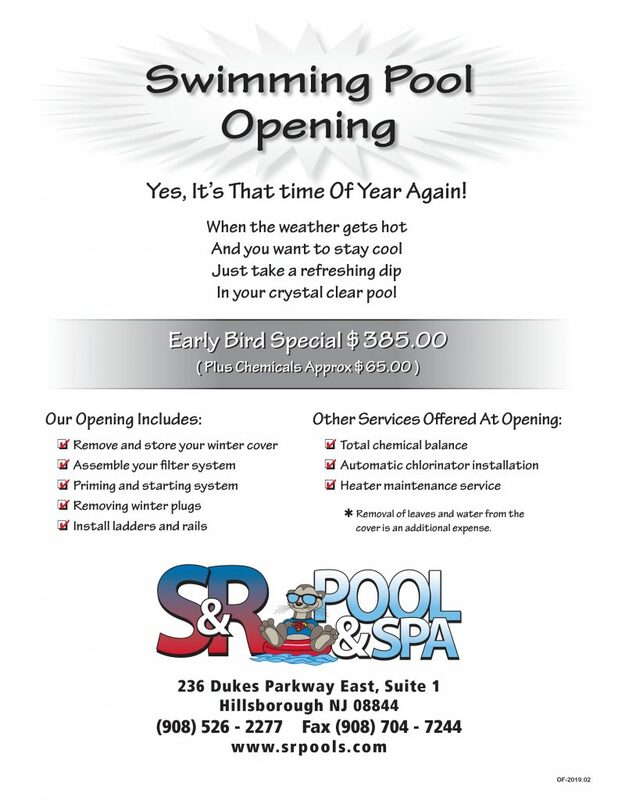 Let the professionals at S&R Pool & Spa get your season off on the right foot with a swimming pool opening . Book your opening before April 1st of this season and receive your opening Algaecide FREE!! !